Since 1993 Robert Bauval has been embroiled in the many controversies involving the search for the lost treasures of the pyramid builders and the quest for the legendary Hall of Records of Atlantis. The strange but true story that he unfolds implicates American business moguls, the prestigious National Geographic Society, several Ivy League universities, the Edgar Cayce Foundation, the Freemasons, Christian fundamentalists, Zionists, and the Egyptian government. 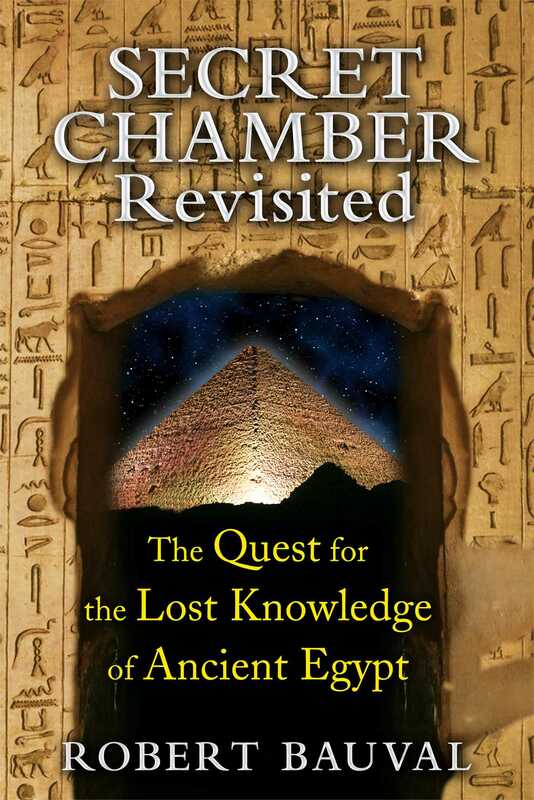 In this fully updated edition of Secret Chamber, including new color photographs, Robert Bauval pursues his in-depth investigation of clandestine events at Giza and the role played by the controversial ex-Minister of Antiquities Dr. Zahi Hawass. What lies behind the mysterious doors at the end of the star shafts in the Great Pyramid? What do the mysterious inscriptions found behind the Gantenbrink door mean? What is the real purpose of the Relief Chambers and the red ochre “graffiti” in them? Who is behind the secretly tunneling and excavating in these chambers, and why? Is there really a hidden Hall of Records from Atlantis beneath the Great Sphinx? Is the Great Pyramid just a tomb or does it serve a higher purpose involving a lost science of immortality? Why do the ancient texts ascribe the Pyramid’s design to the supreme god of wisdom Thoth, the writer of the fabled Books of Hermes? Will the Great Pyramid prove to be the “missing link” to our true origins or a “metaphysical machine” to access the world beyond? Providing a firsthand account of the strange events that have taken place at the Giza plateau in the last three decades, Bauval reveals the hidden agendas behind these events and raises important questions about the meaning of Egypt’s ancient structures and the very origins of civilization. There is nothing more awesome or more provocative than the sight of the Giza necropolis, the home of the Three Pyramids and the Great Sphinx. Giza, few will deny, personifies the mysteries of our remote past and also symbolizes that universal yearning and age-old expectation that one day a great discovery will be made, one that will totally alter our perception of who we really are and where we have come from. The Giza necropolis is situated approximately ten kilometers west of modern Cairo, half an hour by car from central Cairo. The necropolis is best approached from the east through the village of Nazlat El Sam’man. Flanked by busy coffee bars, souvenir shops, and restaurants, the high street of Nazlat is a bustling array of donkeys, camels, horses, street vendors, and the proverbial hawkers. Upon reaching the extremity of this street, the humdrum of modern Egypt suddenly switches itself off as you are confronted with an alien landscape and the gaze of the venerable sentinel of the ancient mysteries, the human-headed lion-bodied statue universally known as the Sphinx. The Sphinx has been deliberately made to face due east, the place of the rising sun at the equinoxes. Weather-beaten by the elements and scarred by vandals and thieves, the Sphinx testifies to the passing of three great civilizations: Pharaonic, Greek, and Roman. It may well see our civilization through, as well. The Sphinx is sixty-five feet tall and forty-five feet wide. It sits, with front paws outstretched, in a U-shaped pit. In 1991, Boston geologist Robert Schoch and Egyptologist John Anthony West created a huge controversy over the age of the Sphinx. They pointed out that the vertical erosion fissures attached a date of more than 8,000 years on the statue. In 1996, Graham Hancock and I showed, with the use of precessional astronomy, that the Sphinx must be linked to the date of 10,500 BCE. Weighing as much as six million tons and towering 480 feet above the ground, the statistics of the Great Pyramid are mind-boggling: more than two and a half million blocks--each weighing an average of two tons--were needed; the construction is perfectly set out and perfectly aligned to the four cardinal directions, and all this, according to Egyptologists, without the use of iron tools, the wheel, or even the simple pulley. As if this was not enough, the builders flaunted further their engineering prowess by incorporating within the pyramid a complex system of inclined passages, tunnels, galleries, and chambers. There are three chambers in the Great Pyramid: one subterranean and two within the superstructure, the latter two being known as the Queen’s Chamber and the King’s Chamber. Some of the blocks and beams that make up the King’s Chamber weigh as much as seventy tons, jointed so tightly that even a razor blade cannot be passed through them. Above the King’s Chamber of the Great Pyramid are five so-called Relief Chambers. This nomenclature, as the eminent French structural engineer Professor Jean Kerisel observed, could not be more inappropriate, for these chambers are anything but “relief” to the pyramid. They actually add some 2,000 tons of dead weight to the walls of the King’s Chamber, causing unnecessary compression on the already strained walls. These Relief Chambers were discovered in 1837 by the British explorer Colonel Howard-Vyse, who had to use gunpowder to create an access to them. In three of the chambers were found ancient graffiti, the only extant writings ever found in the inside or the outside of the Great Pyramid. These chambers were the subject in late 2013 to a huge international scandal after two German explorers removed 1.5 mg of the red ochre graffiti. When the Great Pyramid was first opened in 820 CE by the Arabs, they found nothing except an empty sarcophagus inside the King’s Chamber. As British Egyptologist Flinders Petrie pointed out, the sarcophagus is slightly larger than the entrance to the chamber, proving that it was placed within the chamber before the latter was closed from the roof. The austerity and simplicity of its design make it difficult to imagine that it was used for a royal burial. Many researchers today agree that the pyramid was probably used principally for elaborate and very occult ritualistic purposes. Shooting upward from the south and north walls of both the King’s Chamber and Queen’s Chambers are two narrow shafts with rectangular cross-sections of 8 × 8 inches. Those from the King’s Chamber run right through to the outside of the pyramid, whereas those from the Queen’s Chamber stop some 59 meters within the solid core of the monument. Thought at first to have been ventilation shafts, these strange devices are now recognized to have been aligned to important star systems and thus undoubtedly used for ritualistic purposes. Since the ninth century, all efforts to find a secret chamber have met with frustration. From treasure hunters with battering rams in the Middle Ages to the use of gunpowder by Colonel Howard-Vyse in 1837 and more recent radar and seismographs, no secret chamber has yet been found. Egyptologists became convinced that no such chamber existed. Then, on March 22, 1993, everything changed. A team working under the German Archaeological Institute in Cairo sent a small robot into the unexplored southern shaft of the Queen’s Chamber. The robot reached the end of the shaft some 60 meters from the Queen’s Chamber and sent images of a mysterious small “door” embossed with two copper handles. In 2002 a team from the National Geographic Society, also using a robot, found a similar door at the end of the northern shaft of the Queen’s Chamber. Although strongly suggestive of concealed chambers beyond, the Egyptologists were so opposed to this idea that a huge debate ensued, causing the Egyptian authorities to ban any further exploration. Explorations were resumed in 2010 but then halted after the January 25, 2011, revolution.